Spring cleaning is a process with many aspects. Oftentimes we focus the bulk of our attention on the house, be it inside or out. We’re forever preparing beds for flowers, tilling gardens, organizing this and that, or painting the shutters. Yet, we invest just as much time and money in our vehicle(s) so why not spend a little time this season giving it a good once over too. Our last post announced National Car Care Month. Just because April has come and gone, doesn’t mean you should stop caring! Though winter may not feel like it’s that far behind us just yet, it is certainly spring at last. Those winter months of sudden heavy snow, ice, and wind are hard on a car. Wash and wax as you might, it will never be the same as a thorough detailing job done right. 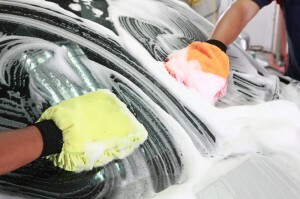 While washing and waxing will leave your car looking clean, it won’t leave it looking like new. Detailing deep cleans the inside, even the trunk, and outside of your vehicle certain using tricks of the trade, like clay barring. This is done in the last stages of detailing, but is what helps leave cars looking shiny and new. Once the outer layer of grim has been washed off, during step one of the process, technicians then use a clay bar to remove any embedded dirt or debris that has decided to latch itself onto the paint. Vehicles are always exposed to these elements, even when stationary. The harsh winter weather in combination with the speed gained while sludge was flying off your and others’ tires is sure to make it even worse. If these tiny particles aren’t cleaned off on a regular basis they begin to penetrate through the clear coat causing further damage. To test if you need a good detail, wash your car and then run a hand over high exposure areas–like the hood, trunk, bumpers or roof–to feel for rough spots. If you notice any bumpiness or roughness, that’s contamination. With a good, annual detail you can save money on paint jobs and other costly body repairs. Check our specials for monthly offers and promotions, call us today at 816-765-6060, or sign up for coupons via email.